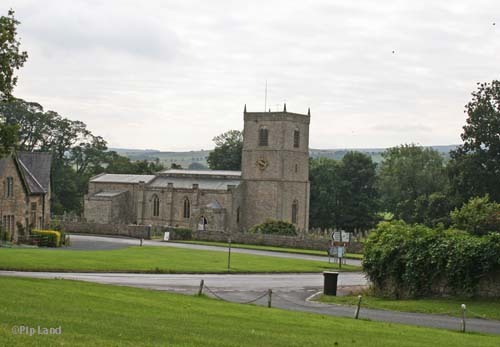 “Wensley’s chief glory is its church, one of the most beautiful and interesting in Yorkshire.” This was how Ella Pontefract and Marie Hartley described Holy Trinity in their book Wensleydale. This 13th century church is now maintained by Churches Conservation Trust and only six services are held there each year. It is open each day from 9pm to 4pm. This doesn’t mean that it no longer plays a significant role within this small but vibrant village community for events like the biannual flower festival, christenings, weddings and funerals are still held there. Bolton Hall, the home of Lord Bolton, is nearby. Lord Bolton is a direct descendant of the Barons Scrope of Bolton who were not only the patrons of Holy Trinity but also of St Agatha’s Abbey at Easby near Richmond, North Yorkshire. This might be why the medieval screen and a reliquary from Easby Abbey came to Holy Trinity after the dissolution of the monasteries in the 16th century. Among the other fascinating items in the church are medieval wall paintings, 16th century carved oak stalls, and a superb Flemish brass. For more about Holy Trinity see Wensley church - the story writer’s church. All content ©2015-2018 Copyright Penhill Benefice except where stated. All rights reserved. Photographs ©2015-2018 Pip Land unless otherwise stated.